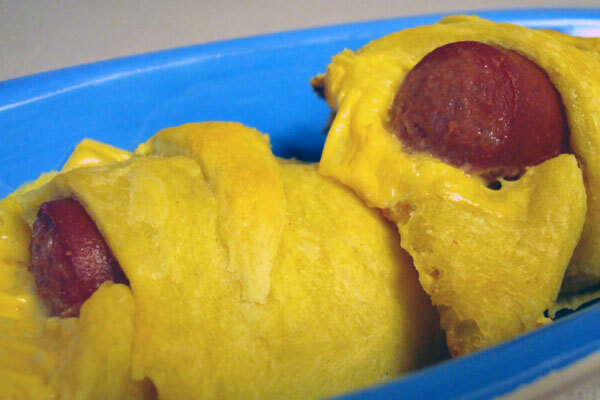 Inspired by the kitschy recipes in my Mini Mart a la Carte cookbook, I made a healthier version of Cheese Dogs for my BF the other night. Pair ’em with diet cherry cola, and you’ve got a perfect meal for noshing in front of the TV, watching “Family Guy”. Preheat oven to 375 degrees and mist a baking sheet with non-stick spray. Roll out crescents into individual triangles. Break cheese into small pieces; place in thin layers on the triangles. Cut hot dogs in half. Please one half hot dog on top of cheese on triangles. Roll triangles into crescent shape and place on baking sheet. Entry filed under: food review, recipes. Tags: semi-homemade recipes.